This is the last eclipse of the second nodal family within this season. There will be two more eclipses (solar and lunar) in January 2019 of the 2nd nodal family. This particular eclipse is fairly new, having originated in 1928 on June 17th. Similar to a birth chart, the characteristics of the first chart for the saros series will influence all following eclipses in the series. The initial eclipse occurred at 26 degrees of Gemini, with traits of impulsive reactions along with analytical thinking and adaptive motivations. We are likely to feel these traits during the eclipse period. How we experience the eclipse will depend on how we utilize those traits. 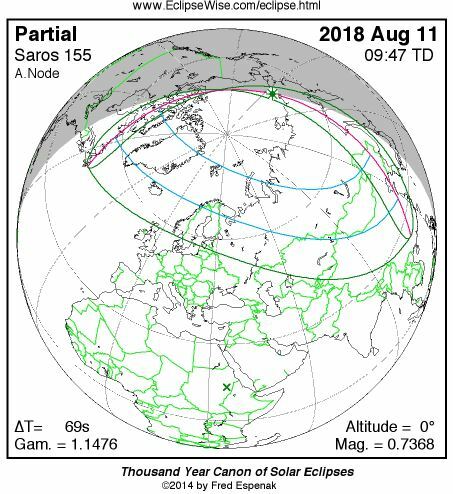 This eclipse will eventually replace saros series 117 within this eclipse season. The eclipse is partial and will be visible in the extreme northern hemisphere. For all intents and purposes, the eclipse will be so far north, that a flat map does not do it justice. We are including a "visibility map" created by Fred Espenak, the eclipse expert, to help with the "reality" of the eclipse from a different perspective. 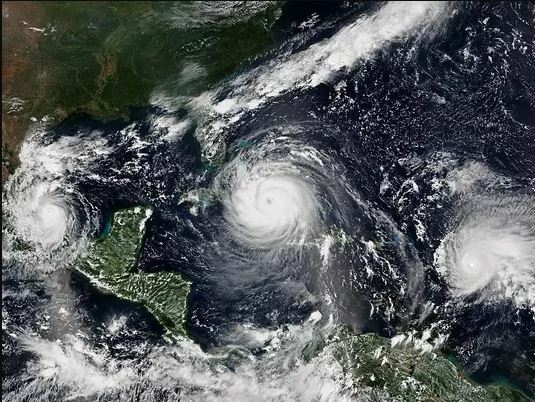 It will originate over North America, moving across Canada and eventually end up over China. However, it will be visible in Greenland, Scotland, over the Nordic region, and Russia, also. 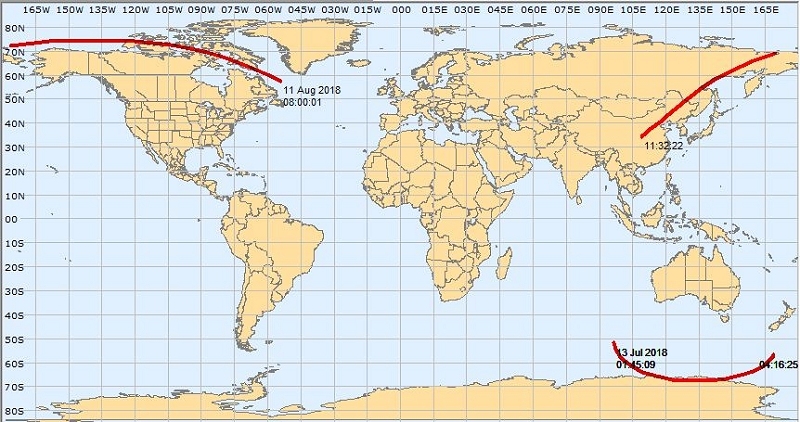 Both North and South Korea may be able to observe the eclipse near the time of sunset. The maximum phase of this partial solar eclipse will occur over the East Siberian Sea. Remember, if you want to observe any solar eclipse, special protective eyewear is essential and not standard sunglasses. The August 11 new moon eclipse in the sign of Leo is focused more on the self. There is a natural leader vibe with this eclipse, but at the same time, we are thinking more about how the self will be impacted by any leadership choices and decisions. There is a risk-taking element to this eclipse. Don't chance more than we are willing to lose at the moment. On the positive side though, if we push and explore with our skills and natural talents, we may make new discoveries that change us, as an individual, and even for the world. The new moon is conjunct with Mercury retrograde, impacting how we communicate or interact with others. Our thinking patterns may be contrary to our usual ideas. That's not a bad place to be, but it may feel foreign to us. We need to think matters through with more precision to get the most out of our ideas. The eclipse stellium is square to Jupiter in Scorpio. Ever hear that adage, "if it weren't for bad luck, I'd have no luck at all"? Well, this may be one of those alignments that feeds into that feeling. However, this may speak more to our past choices, than about our luck. This may simply be the "reward" we are receiving for a choice we made in the past. Use it as a learning moment, rather than letting it drop us into despair. Additionally, remember that the eclipse, in Leo is focusing more on self. Self-awareness is going to be critical to our growth through this eclipse. Please note that there are mostly retrograde transits. If we throw Chiron's retrograde into the mix, there are seven planets transiting in retrograde motion, making this a difficult time to be a "forward thinker." Yet, that is what we need to be doing to move beyond our mistakes. Venus is positioned in an interesting symmetry mix of alignments with Mars, Saturn and Uranus. These four planets share mirrored trines and squares that overlap, adding intensity to their shared aspects. Venus is the only planet, of the four, that is moving direct. The rest of the planets are transiting retrograde. Venus is transiting through home territory in Libra, which helps it to feel stronger and more assertive. In an attempt to break this down, you may want to look at the chart below in order to get a better sense of the dynamics. Venus in Libra trines Mars retrograde in Aquarius on the cusp. Mars is ready to transit back into Capricorn. At this time, Mars is also transiting Out of Bounds (OOB) which adds intensity to everything. Natural disasters during the Mars OOB transit tend to be more tragic. Venus will do its best to soften some of Mars' intensity, however, there is only so much Venus can do when Mars is clamoring for a fracas. Venus is square to Saturn retrograde in Capricorn. This aspect indicates that we will be expected to work smarter, not harder, if we want to reap any rewards from these two. Uranus retrograde in Taurus is mirroring Venus, with a trine to Saturn retrograde (Capricorn) and a square to Mars retrograde (Aquarius). While Uranus would normally push us into the unexpected and disarray, simply to mess with our heads, the retrograde version of Uranus is more subtle and subdued. We can find ways to sidestep some of the excitement by being prepared and by paying attention to the clues that get thrown out there for us. Typically, the square between Mars and Uranus involves hard lessons in life with no easy solutions. Lessons are still there, but we are likely to see the value of them more quickly. The trine between Saturn and Uranus is supposed to teach us about organizing within the chaos. This one may be much easier than usual since we are mostly feeling like we are in the rinse and repeat cycle with these two. Another interesting feature about this eclipse chart is the way that Jupiter is used by the Stellium of the "fast" planets that tie into the "slow" planets. The square from the stellium (conjunction of Sun, Moon and Mercury retrograde) to Jupiter connects to the generational planets, Neptune retrograde in Pisces with a trine, then from Neptune to Pluto retrograde in Capricorn with a sextile. We will be expected to blend all these influences together and make peace with the outcome. Our dreams and our wisdom from past experiences may be useful in navigating the events of this eclipse. We are also likely to become aware of information that was kept hidden from us in the past. We need to be careful not to hold on to anger or take revenge, as that will cause us to lose the value of the new found insight. While the chart's placements are balanced pertaining to receptives and elements, there is an excess of placements in the Fixed signs that can cause us to be less adaptive to change. Solar eclipses are fraught with change, and we may simply not feel ready or capable of leaning in to those changes. On the other hand, if we use the fixed nature of the planets to encourage ourselves to remain determined to improve our situations, we can gradually adapt to the changes that are expected of us. Why is it that madmen are so often perceptive?